I have this silly dream of running 26.2 in every state that I just can’t let go of. There is just something about 26.2 that pulls you back in. Runner’s World recently featured a collection of stories, 26.2 Reasons We Love the Marathon, about what makes this distance just so special. I thought about making my own list, but they just got so many of them spot on that I can’t dictate the difference between their ideas and my own. Some of my favorites from their list: it’s a reason to travel, post-race beer, the good its runners do for worthy causes, it’s an excuse to get a new wardrobe, the signs (on the course), because it takes over your life-and it’s awesome, the unique thousands of fans cheering on runners, the post-race feast, the swag, it makes the world a better place-really!, playlists, finding your own **** yeah moment (if you don’t know Shalane Flanagan then this means nothing to you), running the same course as the professionals, the best shower of your life afterwards, the runner’s high and the final .2. People joke about the last 1,155 feet, but the final .2 moment is different for every race. It is truly a moment that is unique and rewarding and special every time. This goal has never been about accomplishing the list as fast as I could. I never wanted the goal to interfere in an overall negative way with life in other ways. I like the slow process of building on this goal every year. I like getting to really see a place when I run a new state whenever possible. Each year it is fun to plan where the next race(s) will be. So it is, I find myself training again. Spring marathon training officially began last Monday for me. Even though the snow and cold are just taking hold for good, I know that in a few months (ok, more than that perhaps) warmer weather and greener sights will be back. To help me tackle my ultimate goal, stay on track all winter and feed my need to explore, I’m signed up to check Indiana (Carmel Marathon) and South Dakota (Brookings Marathon) off the 50 State list this coming spring. While I’m excited to get back to following a training plan, I was kind of enjoying running when I could and focusing on the BeachBody LIIFT4 program. This training cycle I will be running 4 days a week and lifting 3 days a week. I’m going to continue another round of LIIFT4, but I will follow the workouts consecutively by doing 3 each week. My weeks will not match up with the program weeks because of this. The eight week program will become 10.5 weeks long. I know yoga is going to need to be a regular part of my training along with a focus on core and hip work. Due to running these upcoming races six weeks apart, my mileage will be a little higher than training for San Francisco. That was a pretty low mileage training plan to begin with as I eased my way back into training for my first post-babies marathon. I’m thinking my body can handle this now. If I’m being honest though, I do have some serious concerns about how I’m going to make all this happen, but having a goal race on the calendar is usually the best way for me to stick to something. I feel my best self when I’m active and training for a race. To accomplish this, I HAVE to get better about getting to bed earlier. I HAVE to get better about leaving work right away a couple of days a week. All of these things will enhance my overall health, but actually doing them is a challenge. My new Fitbit will be reminding me everyday of what my goals are. And like I mentioned before, 26.2 sort of just pulls you back in. It can make you irrational in a wonderful way. As with any new training plan I try to focus on my week ahead only. Dwelling, stressing or worrying about future week plans does not build confidence. 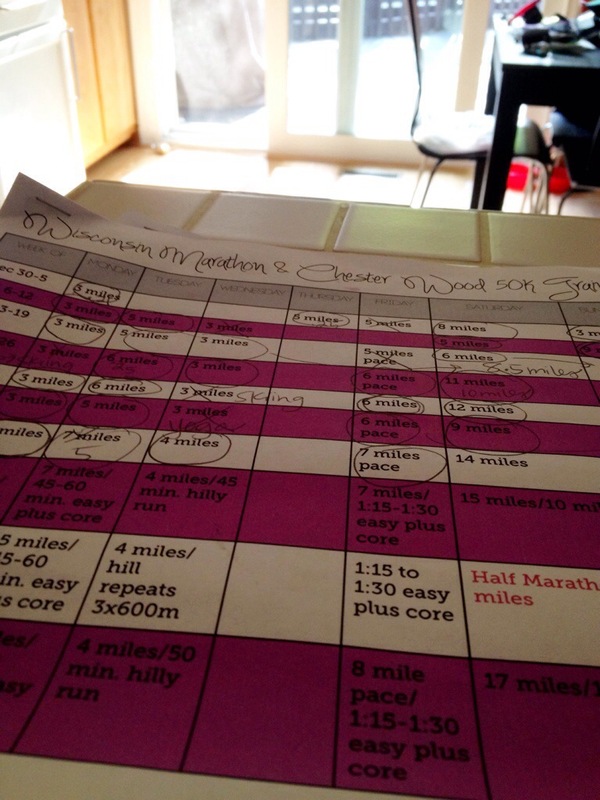 When I see some of the miles on my training plan in two or three months, I can start to feel intimidated. Even though these upcoming races will be my 16th and 17th marathons they never get easier really. Running 26.2 miles is always going to require hard work, perseverance and overcoming unexpected obstacles. While my body knows what to expect and can complete the distance, it doesn’t mean it’s a cake walk for me. I can’t wait to explore two new states on foot. Half the fun of my goal is getting to see a new city/state, taste yummy food and local beer, and feed my exploring needs. I will be posting training updates to help me stay accountable and to serve as my training log since these are helpful to look back on. For the first time since having P I’m not talking about anything to do with him when I say childlike joy. Wednesday was a trying evening. All the demands and the to-do list got to me. I found myself saying, “I just can’t do this.” I was tired. It was past my bedtime. I was, you know, not at my best. The following morning I was blessed with a two hour delay. An extra two magnificent hours to get some stuff done. I took part of that time to go for a run. Finding time for myself is near impossible, so when I’m given an opportunity to run I take it bad weather or not. The snow was fresh. A blank canvas just waiting for my footprints. I love winter running days like this. 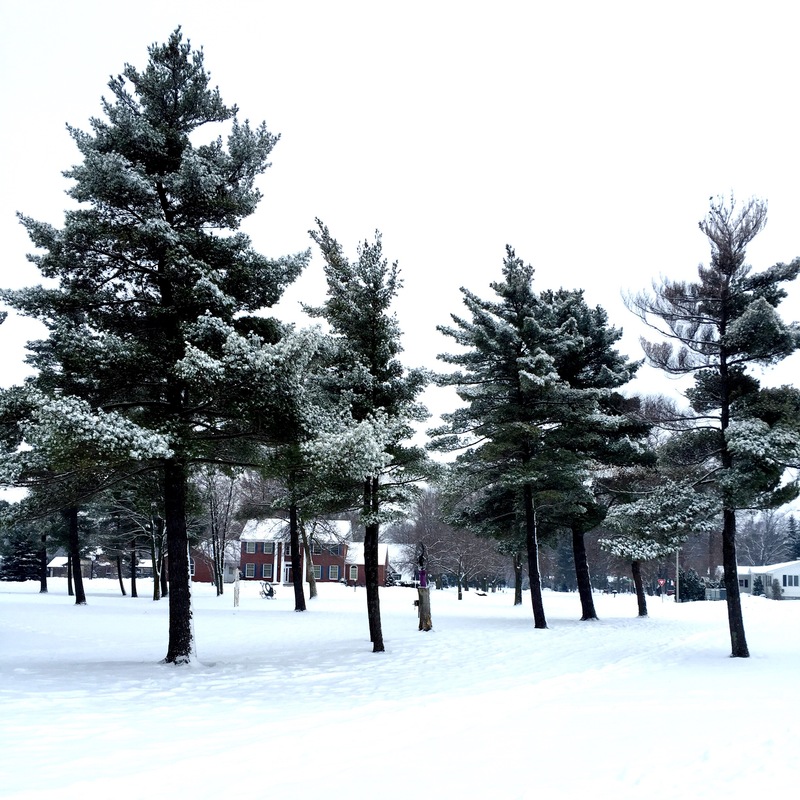 Fresh snow on trees. Covered sidewalks means probably not slippery. Snow bank jumping. Being the first person to make their footprints in a path. A hard, but rewarding workout is almost guaranteed. During my last half mile a favorite song that I wouldn’t normally run to came on, big fat snowflakes started falling and I felt the unfamiliar-these-days running high. 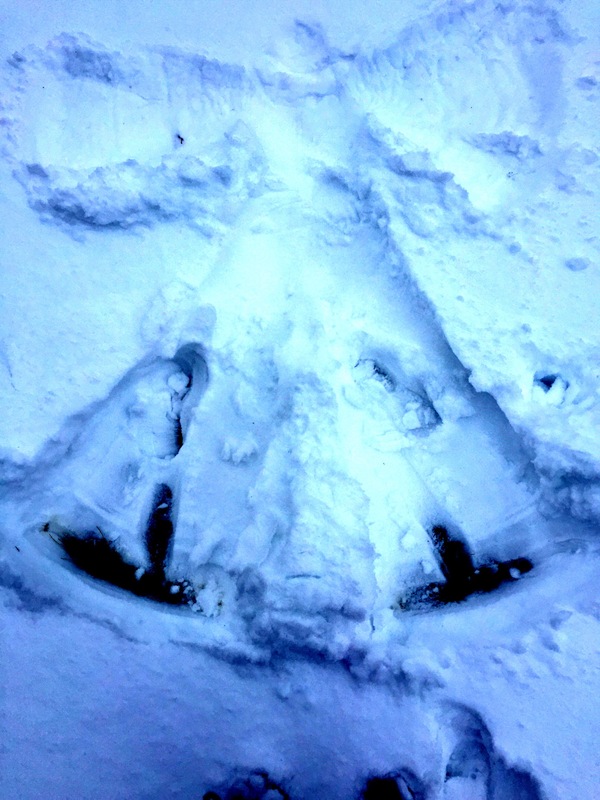 When I turned on my street I felt an intense desire to make snow angels. 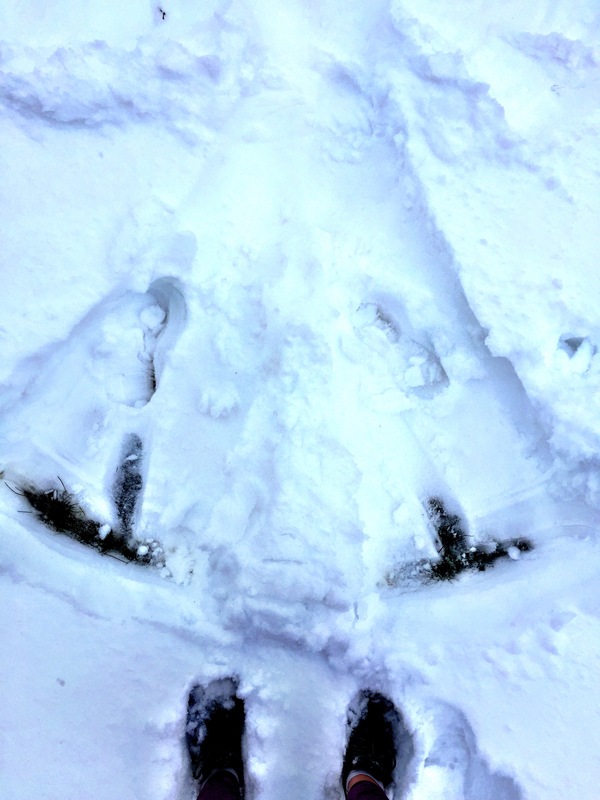 I immediately headed to the backyard and made a snow angel. I took in the peaceful silence that only winter brings. If you’ve spent time outside on a snowy day without wind you know what I mean. 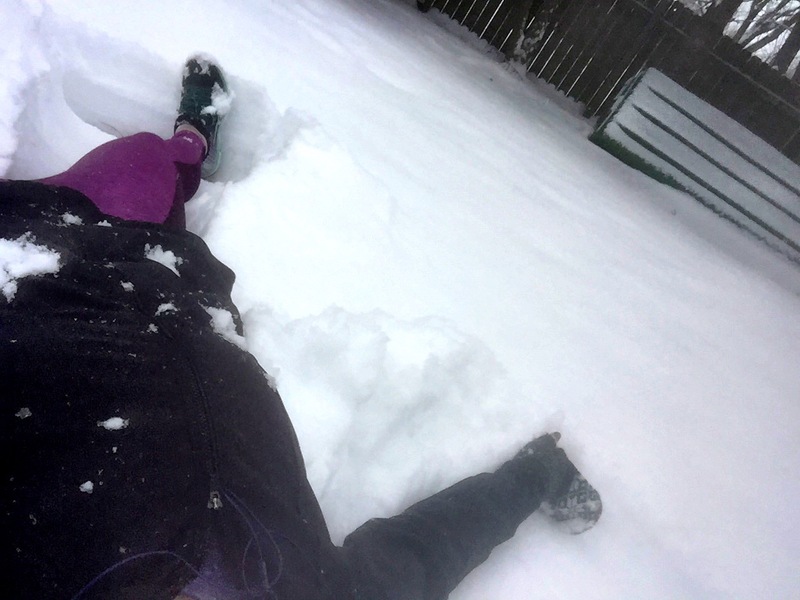 As I snow angeled away, I closed my eyes and felt the snowflakes hit my face. Big. Fat. Snowflakes. I felt like a child again. My heart was bursting with childlike joy that makes keeping a smile off your face impossible. My stresses melted away. The to do list gone from my mind. 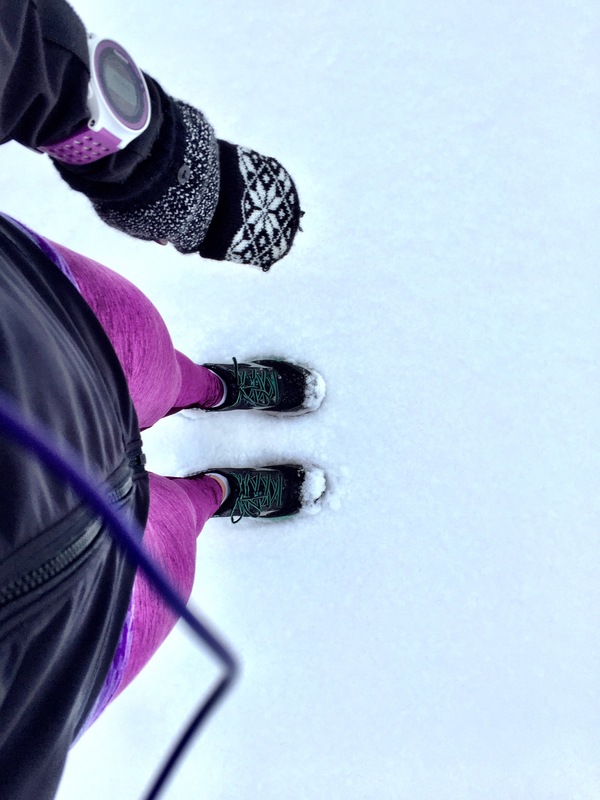 And people wonder why runners run-especially in the winter. Don’t knock it until you’ve tried it! I hope you find some childlike joy this weekend. I run because…I need balance in my life. Some people will be wondering what is next after my 50k. After following (although somewhat loosely at times) a training plan since the last week in December, I’m sort of ready to run what I want when I want. I’ve got some recovery action that will take place this next week, followed by some inbetween marathon training that will let me be flexable while also keeping me in shape for my next races-the Foot Traffic Flat Marathon on July 4th in Portland, Oregon and the Missoula Marathon on July 13th in Montana. The plan will allow plenty of time to enjoy summer, the husband and whatever else I feel like doing. 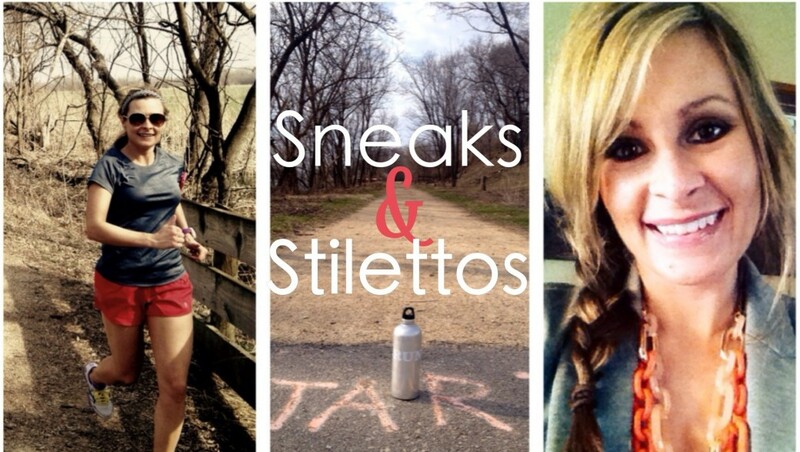 Finding balance between being a runner and a person is so important for me. I love my time alone on the roads and trails, but I also need the social fun of being with others. Too much of one or the other leaves me unbalanced and feeling cranky. All day I’m surrounded by people-from the adults I work with to the 130 students I see in a day to the athletes I coach. Running offers me time to hear my own thoughts in my head, to process what I feel, and to rejuvenate myself for the next day. On the flip side too much time alone on the road or the trails makes me sad and puts feelings of discontent in my heart. 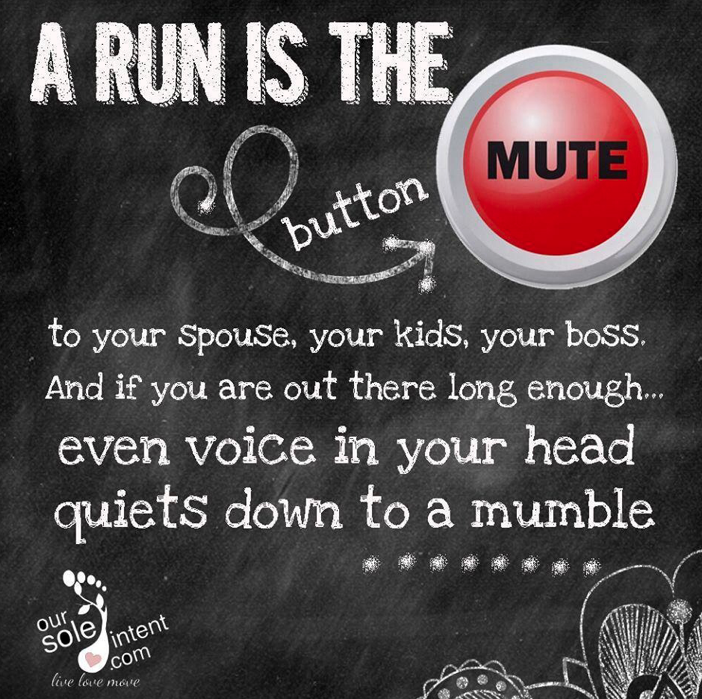 Being around my students, friends, family and the husband help to restore the fun in my life in a way running doesn’t always fulfill. After too much time alone I crave being around others. I find I am happiest and most content with running when I am happiest and most content outside of running. When my life is full (but not too full) running provides me with the greatest joy. When life is challenging and difficult running provides me with an outlet, but often it is not my best or favorite time to run. 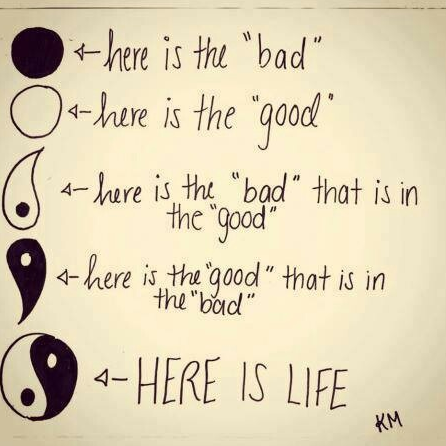 I like this image, but tend to think that life is more good than bad. The yin-yang would need to be a little uneven to represent how I view this balance. Running encourages balance in life. Running allows me to sort through all my responsiblities and still make time for myself. Running helps me see that work is work and sometimes there is more to life than just your job. 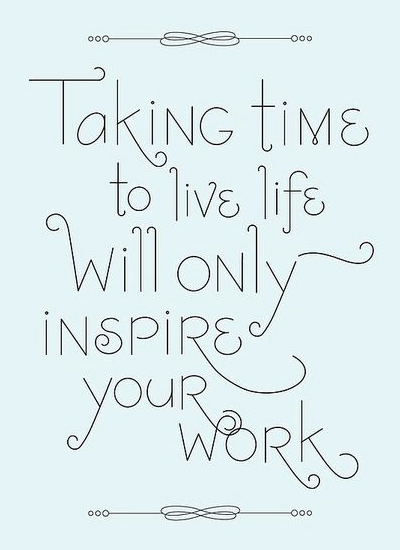 Running also helps me to see how much I love my job and gets my creative juices flowing while my feet hit the pavement. While out on runs I’m reminded of how great the people are in my life and all they do to support me. This is especially important when people in my life are frustrating me. Running simply gives me time to think about all I’m juggling in life. Balance in all parts of life is always important. I don’t believe for a second that I have this figured out, nor do most people (I think, I hope). Running miles helps me find more balance than if I were not a runner. This is just one more benefit and reason why I love this sport. 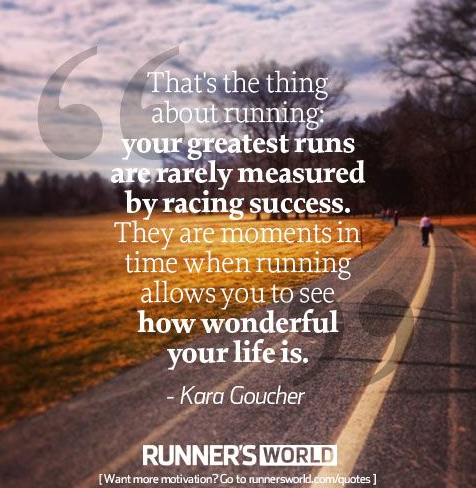 How do you find balance between running and the rest of your life? Tips? Suggestions?